When we think of mushrooms and the southern Mexico state of Oaxaca, the first thing which traditionally comes to mind is María Sabina, Huautla de Jiménez and hallucinogenic "magic" mushrooms. But slowly that's all changing as a result of the groundbreaking work of Josefina Jiménez and Johann Mathieu in mycology, through their company, Mico-lógica. Based in the village of Benito Juárez, located in Oaxaca's Ixtlán district (more commonly known as the Sierra Norte, the state's main ecotourism region), Mico-lógica's mission is threefold: to train both Mexicans and visitors to the country in the low-cost cultivation of a variety of mushroom species; to educate about the medicinal, nutritional and environmental (sustainable) value of mushrooms; and to conduct ongoing research regarding optimum climatic regions and the diversity of substrata for mushroom culture. The French-born Mathieu moved to Mexico, and in fact to Huautla de Jiménez, in 2005. "Yes, coming all the way to Mexico from France to pursue my interest in mushrooms seems like a long way to travel," Mathieu explained in a recent interview in Oaxaca. "But there really wasn't much of an opportunity to conduct studies and grow a business in Western Europe," he continues, "since reverence for mushrooms had been all but completely eradicated by The Church over the course of centuries; and I learned that Mexico still maintains a respect and appreciation for the medicinal and nutritional value of hongos. Mexico is far from mycophobic." Huautla de Jiménez is more than a five hour drive from the closest metropolitan center. Accordingly, Mathieu eventually realized that staying in Huautla, while holding an historic allure and being in a geographic region conducive to working with mushrooms, would hinder his efforts to grow a business and cultivate widespread interest in learning about fungi. Mathieu became cognizant of the burgeoning reputation of Oaxaca's ecotourism communities of the Sierra Norte, and indeed the Feria Regional de Hongos Silvestres (regional wild mushroom festival), held annually in Cuahimoloyas. Mathieu met Josefina Jim&eacue;nez at the summertime weekend mushroom event. Jiménez had moved to Oaxaca from hometown Mexico City in 2002. The two shared similar interests; Jiménez had studied agronomy, and for close to a decade had been working with sustainable agriculture projects in rural farming communities in the Huasteca Potosina region of San Luis Potosí, the mountains of Guerrero and the coast of Chiapas. Mathieu and Jiménez became business, and then life partners in Benito Juárez. Mathieu and Jiménez are concentrating on three mushroom species in their hands-on seminars; oyster (seta), shitake and reishi. Their one-day workshops are for oyster mushrooms, and two-day clinics for the latter two species of fungus. "With reishi, and to a lesser extent shitake, we're also teaching a fair bit about the medicinal uses of mushrooms, so more time is required," says Mathieu, "and with oyster mushrooms it's predominantly [but not exclusively] a course on cultivation." While training seminars are now only given in Benito Juárez, Mathieu and Jiménez plan to expand operations to include both the central valleys and coastal regions of Oaxaca. The object is to have a network of producers growing different mushrooms which are optimally suited for cultivation based on the particular microclimate. There are about 70 sub-species of oyster mushrooms, and thus as a species, the adaptability of the oyster mushroom to different climatic regions is remarkable. "The oyster can be grown in a multitude of different substrata, and that's what we're experimenting with right now," he elucidates. The oyster mushroom can thrive when grown on products which would otherwise be waste, such as discard from cultivating beans, sugar cane, agave (including the fibrous waste produced in mezcal distillation), peas, the common river reed known as carriso, sawdust, and the list goes on. Agricultural waste which may otherwise be left to rot or be burned, each with adverse environmental implications, can form substrata for mushroom cultivation. It should be noted, though trite, that mushroom cultivation is a highly sustainable, green industry. Over the past several years Mexico has in fact been at the fore in many areas of sustainable industry. "They can hold up to thirty thousand times their mass, having implications for inhibiting erosion. They've been used to clean up oil spills through absorption and thus are an important vehicle for habitat restoration. Research has been done with mushrooms in the battle against carpenter ant destruction; it's been suggested that the use of fungi has the potential to completely revamp the pesticide industry in an environmentally friendly way. There are literally hundreds of other eco-friendly applications for mushroom use, and in each case the mushroom remains an edible by-product. Take a look at the Paul Stamets YouTube lecture, 6 Ways Mushrooms Can Save The World." 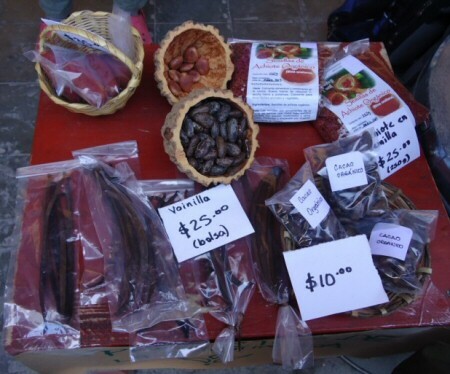 Mathieu and Jiménez can often be found selling their products on weekends in the organic markets in Oaxaca. They're both more than happy to discuss the nutritional value of their products which range from naturally their fresh mushrooms, but also as preserves, marinated with either chipotle and nopal or jalapeño and cauliflower. The mushroom's vitamin B12 cannot be found in fruits or vegetables, and accordingly a diet which includes fungi is extremely important for vegetarians who cannot get B12, most often contained in meats. Mushrooms can easily be a substitute for meats, with the advantage that they are not loaded with antibiotics and hormones often found in industrially processed meat products. Mico-lógica also sell teas and extracts made from different mushroom species, each formulated as either a nutritional supplement, or for their medicinal properties. While neither Mathieu nor Jiménez has the pharmacological background to prescribe mycological treatment for serious ailments, Mathieu's own research points to the medicinal use of mushrooms dating from pre-history, to the present. He notes properties of mushrooms which can help to restore the immune system, and thus the use of fungi as a complement in the treatment of cancer and AIDS, and their utility in controlling diabetes and treating high cholesterol. "We should all be embracing the organic production of mushrooms," Mathieu concludes. "It's so easy, it involves a minimal capital investment, and it provides significant rewards, both for those ingesting hongos for nutritional and medicinal reasons, and for the producers, even small scale. Mico-lógica also sells dried mushrooms. Yet most of the dried mushrooms sold in Mexico are imported from China, and are not organic. It's a real shame on numerous levels." Mexico and mushrooms have come a long way since the era of Oaxaca's María Sabina. With the continued efforts of Mathieu, Jiménez and Mico-lógica, it should not be long before the world understands and embraces the magic of mushrooms within a much broader context. Alvin Starkman traveled to Huatula de Jiménez to experience the magic of mushrooms in the 1960s. A former Toronto litigation lawyer, Alvin now lives in Oaxaca where he takes couples and families to sights in and around Oaxaca's central valleys, works with documentary film companies, and writes about life and cultural traditions in the region. With over 230 articles about Oaxaca to his credit, Alvin is a paid contributing writer for Mexico Today, a program for Marca País - Imagen de México. Alvin and his wife Arlene operate Casa Machaya Oaxaca Bed & Breakfast. This page has been visited times since August 29, 2012.